In the following paragraphs, the cycle of operation of the M-1911 is shown. 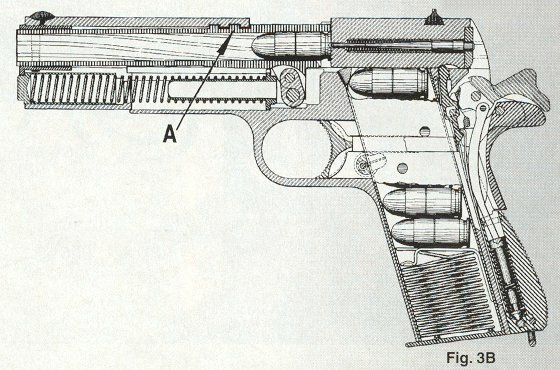 Since any operating cycle should begin at some point, the basic M-1911 operating cycle illustrated here is based on a full magazine first being inserted into the pistol and the slide either having been manually pulled back and released or having been released from the slide locked open position under the pressure of the stored energy in the compressed recoil spring. 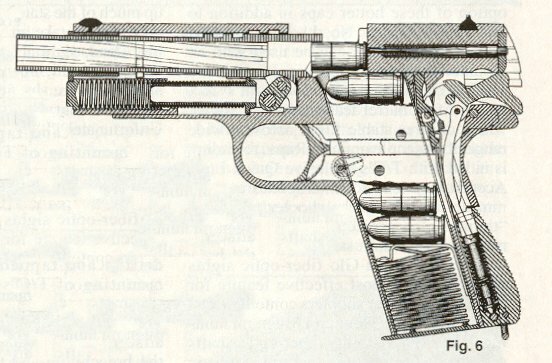 The cutaway in Fig.1 illustrates the relative position of components in the M-1911 during the feeding phase. Cartridge feeding is defined in two ways: (1) The successive upward movement of all rounds in the magazine. 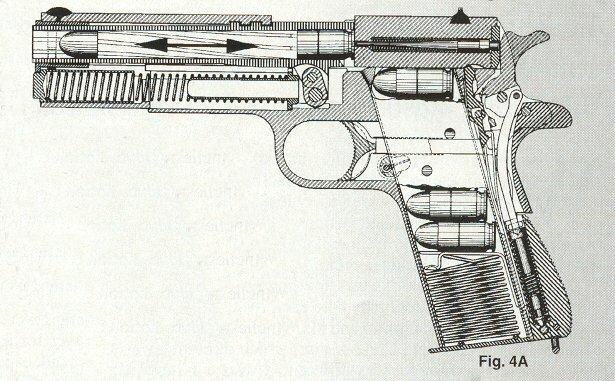 From an ordnance viewpoint, cartridge feeding takes place when a round in the magazine is moved upward into the path of the slide by the magazine follower and spring assembly; and (2) the cartridge ramping action that occurs as the slide moves forward and begins to strip and thereby feed a round forward from the magazine. Chambering occurs when a round is fed from the magazine and placed in the chamber. This action takes place as the slide moves forward under compressed recoil spring pressure; strips a cartridge from the magazine; and pushes the cartridge up the frame/barrel ramp and into the chamber. The initial portion of the chambering phaw is completed as the cartridge breaks over the horizontal plane, aligns with the chamber and the cartridge case rim is engaged by the extractor. Barrel link-up or link-up/cam-up in pistols without custom fit bottom lugs, occurs as the slide assemble continues to move forward and the barrel extension contacts the breechface causing the barrel to pivot upward on the barrel link (arrow). This causes the locking lugs on the top of the barrel to index with the corresponding locking recesses in the slide. Barrel link-up/cam-up in M-1911 pistols with custom-fit bottom barrel lugs is assisted by the camming action of the radiused, bottom front barrel lug surfaces as they bear on and cam upward on the slide lock crosspin. Vertical barrel and slide locking occurs as the slide causes the barrel to swing upward on the barrel link as in figure 3A. 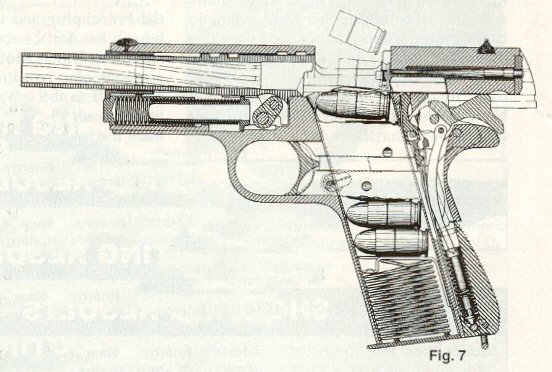 Aggregate barrel, slide, frame, slidestop and barrel link dimensional tolerances determine the extend to which a given barrel will link upward and locking lugs will vertically engage in any given M-1911 pistol. Locked slide position (arrow, fig 3B) permits the disconnector to move upward. This action -see disconnector function below- connects the trigger and sear and prepares the pistol for firing. 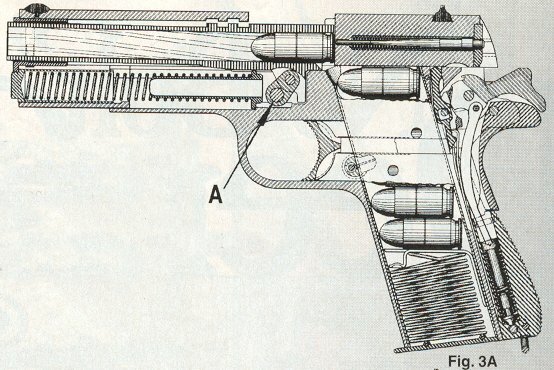 Firing is split into two phases because of the thrust vector existing between the bullet and the breechface, which horizontally engages the locking lug surfaces while the bullet is under pressure in the barrel. 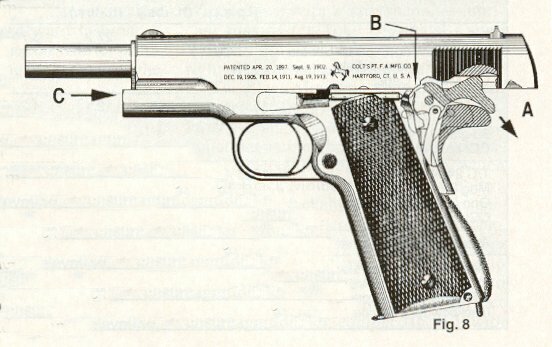 Firing occurs in the M-1911 pistols when the grip safety is depressed; the trigger is squeezed; and the interaction of the trigger, disconnector and sear releases the hammer. The released hammer then transfers its energey to the inertial firing pin, which, in turn, strikes the primer. As the primer ignites the propellant charge in the chambered cartridge, the hot powder gasses expand, building pressure that forces the bullet down the barrel. 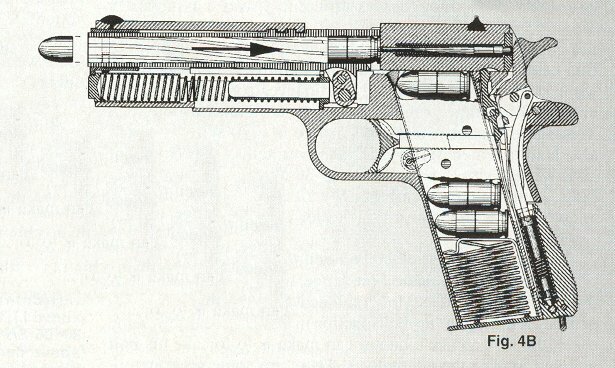 As shown, the barrel and slide remain locked together both horizontally and vertically during the initial firing phase. At the end of the firing phase, the bullet exits the muzzle and drops gas pressure inside the barrel. Bullet departure breaks the balanced thrust vector established when the bullet was in the barrel as in fig. 4A. 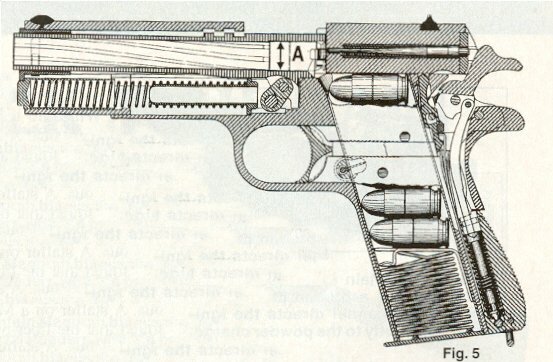 In terms of the effect on the pistol, this action enables the top locking lugs to horizontally disengage (see National Match barrel note in next phase) and imparts a rearward force on the slide assembly equal to the inertia of the departing bullet. Then, because the slide assembly has a greater relative rest mass -plus the added benefit of the recoil spring- inertial energy is absorbed as the slide recoils to the rear. 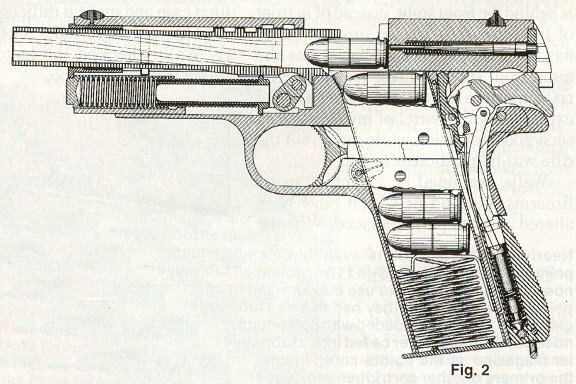 In pistols with standard ordnance dimension barrels, barrel linkdown and vertical locking lug disengagement begin momentarily after the lugs horizontally disengage at zero breech pressure just after the firing of a chambered round. Fired cartridge case extraction (see next phase) actually begins at the start of barrel linkdown with the initial breaking of friction between the fired/expanded cartridge case and chamber wall, as show at A below. Note: National Match barrel hoods are hand-fit to maintain horizontal lug engagement until the barrel links down. As shown in fig. 6, fired cartridge case extraction occurs with continued rearward movement of the slide and as the breech begins to open when the barrel links down. The rim of the fired cartridge case is held firmly against the breech face by the extractor as it is drawn back by the energy of the recoiling slide. Continued rearward movement of the slide then fully withdraws and thereby extracts the fired cartridge case from the chamber. 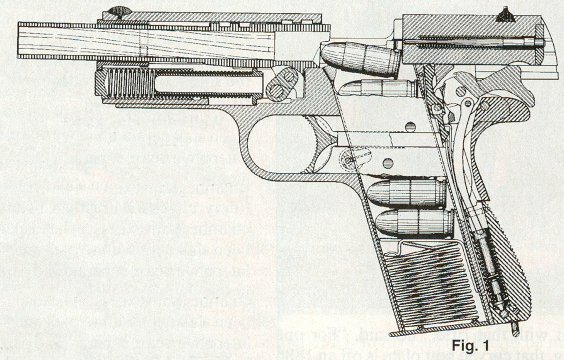 As the slide moves further rearward after firing, the fired case is extracted from the chamber as shown in fig. 6. The extractor hook retains the cartridge rim and holds the case against the breech face. Continuing rearward slide movement then brings the left side of the case into sharp contact with the front of the ejector located on the left side of the frame. This action causes the fired cartridge case to pivot upward and to the right; frees it from the extractor; and ejects the case through the ejection port. Cocking occurs as the hammer is positioned to fire the next round by the continuing rearward movement of the slide. Specifically, the slide rotates the hammer back, as shown at A below; moves the hammer strut downward; compresses the hammer spring and enables the sear, under sear spring pressure to engage the hammer's full cokc notch at B. Further rearward slide movement, C, then fully compresses the recoil spring for the next firing cycle. When the magazine is empty, the magazine follower forces the slide stop upward to engage the slide stop notch in the slide and thereby locks the slide open.